This trendy 50 sq m space is located in the prime area of Le Marais and is ideal for Pop-Up stores, Product Launches and Showrooms. This store is classic in layout and has a series of windows and a floor-to-ceiling glass door. the interiors are modern with a trendy edge, white walls with graphic black accents and a range of display furniture create a dynamic and contemporary atmosphere. 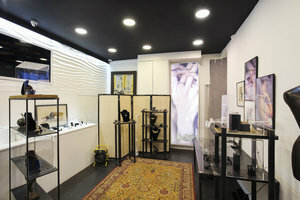 There are a variety of facilities here including a stock room making this boutique space well-suited to retail. This boutique is advantageously located on a corner in the bustling area of Le Marais close to Saint-Paul Métro and is surrounded by popular stores.